One of the things I enjoy most about traveling is eating local foods from locally owned restaurants. Although we do most of our own cooking in the RV, especially when we are in a campground far from civilization, we will go out of out way to find good food. To find a truly authentic place, we like to ask a local where the locals eat. When we find something we like, we have been known to get enough to fill up the freezer to eat later in the trip and maybe even save some to take home. 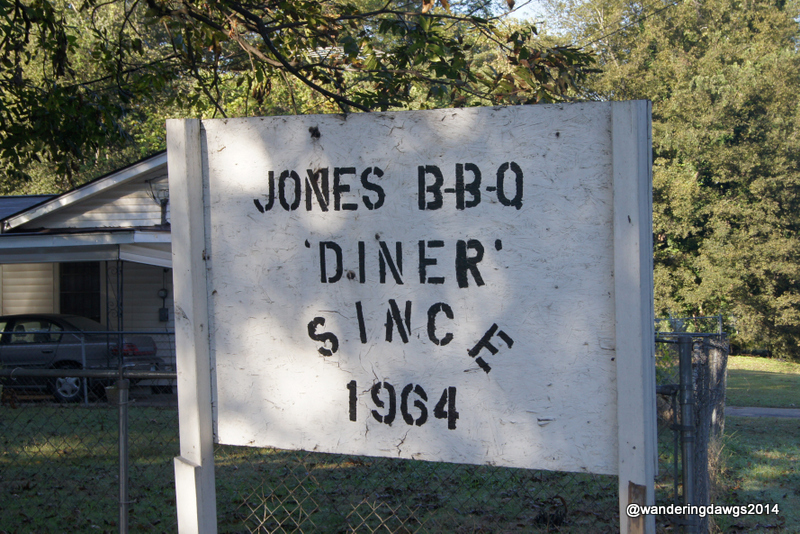 Jones Bar-B-Q Diner in Marianna, Arkansas was just such a place. The only James Beard Award winning restaurant in Arkansas, we would have never known about it if park ranger John had not told us about customers lining up around the building to get some of the famous, award winning barbeque pork. We would have to get there early. John told us the restaurant opened at 7:30 am and stayed open until they ran out of BBQ. We could smell the pork cooking before we even found the restaurant. Arriving at at 9:00 am, we walked into a small dining room with only 2 tables. Two other people were leaving as we came in so we were the only customers. Pit-master and owner James Jones was standing behind the window where I placed my order for 5 pounds to go. Behind him I could see tables covered with loaves of Wonder Bread and large jugs of his famous sauce.The prices were listed on a sign above the window. The menu is simple – pulled pork barbeque by the pound or sandwich. The sandwich is served on white bread with or without coleslaw. As Mr. Jones wrapped my order in foil and placed it in an aluminum tray to go he told us a little about his business. His family has been making BBQ using the same recipe for several generations. Although the sign outside says since 1964, he told us family has been making BBQ using the same secret family recipe since the early 1900’s. It was such a treat to meet Mr. Jones and spend time talking with him. He answered all our questions about winning the James Beard Award and traveling to New York City to receive it. I asked him if he had to wear a tux. His answer was “no, I wore a suit but one of the other winners had on overalls.” When someone asks for his secret recipe, he tells them his father would come back from the grave if he gave away the secret. Back at the campground, I put some pork and coleslaw (served in a mason jar) in the fridge for dinner that night and the rest in the freezer for later. When dinner time finally arrived, we enjoyed unbelievably delicious BBQ unlike any other I have ever tasted. Close your eyes and imagine the smokey aroma of pork slowly cooking over a hickory and oak fire. Imagine biting into pork so tender it practically melts in your mouth. Imagine the pork dripping with a BBQ sauce that is vinegary yet sweet with just the right hint of heat. Believe me, it is worth a trip from anywhere to try this BBQ! 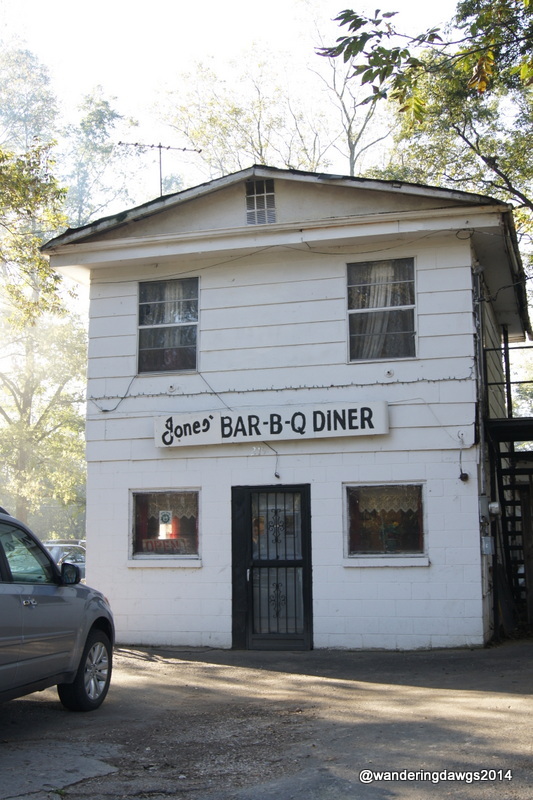 Jones Bar-B-Q Diner, 219 West Louisiana Street, Marianna, Arkansas, is owned by James and Betty Jones and is one of the oldest African-American owned restaurants in America. We were camped at Mississippi River State Park near Marianna when we visited Jones Bar-B-Q Diner. Your descriptions of the James Jones barbecue were DELICIOUS. I’m still smacking my lips. Thanks for the heads up. It’s on our bucket list. We’ll save enough cash to carry it out in the bucket. But . . . I-i-i-i-i don’t know. The real thing might just waft me off to heaven right then. And awesome pics by the way of the Mississippi campground. I’m enjoying your journey. Keep up the good work, Georgia Girl. My Georgia Boy Mike is gonna love this. He’s already got a designated computer list of campgrounds and places to see. It’s filling up so fast we’ll have to ask God for an extra lifetime to see them all. I’m already trying to figure out how we can go there again on our next trip! I have a bucket list of campgrounds where we “must” stay. I checked off a couple of them on this trip. Mississippi River SP was one of them. We didn’t have enough room in the freezer to bring that much back! If you ever stay in the state park tell John to bring a fishing pole and get an Arkansas license. We saw fisherman in the lake the whole time we were there. What a gem of a find. Thanks for sharing. Sorry if I made you hungry! It really was that good. Holly, we love to try BBQ in different places. It’s always different everywhere we go. This was one of the best.